Fallen wet leaves, the end of the mid-term break and a rail service at capacity are among the reasons for service delays. AS AUTUMN ROLLS on, delays have increased for public transport commuters. There are a number of reasons for these seasonal delays, however. Firstly, for rail users, there’s the annual issue of autumn leaves on train tracks. Around this time of year, trains need to make slower journeys and brake much sooner before approaching a train station due to mulch from compressed wet fallen leaves. The problem is experienced by many Northern European railways at this time of year, and some North American ones too, an Irish Rail spokesperson has said. Between mid-term break ending, schools resuming, weather detiorating it is the busiest time of the year for public transport, says Rail Users Ireland (RUI) spokesperson Mark Gleeson. Last month, Dublin Bus added over 390 extra journeys each week to Route 1, Route 14, Route 15a/b, Route 27 and Route 84. “These improvements represent an increase in peak and off-peak frequency Monday to Friday,” a spokesperson has said. The company is currently assisting Dublin City Council with its annual traffic count. Last year’s figures showed that over 50% of city commuters are now using public transport. In September, Irish Rail tweaked timetables in an effort to improve services. And with more passengers, this service is at capacity, the company has said. On DART and Commuter services, Irish Rail says that growth has averaged 10% in each service over the last three years. “This is the single most significant factor in the current capacity issues being experienced on peak services,” according to a spokesperson. However, “shorter-term capacity enhancement measures are urgently required,” they added. Dart frequency is set to increase by the end of the month, according to the spokesperson. All peak services will be six or eight carriage trains with capacity of up to 1,300 per train. In November, National Transport Authority Chief Executive Anne Graham told the Joint Oireachtas Committee on Climate Action that the rail network is at full capacity and that all fleet carriages are being used. Options for additional fleet in the shorter term, however, are complicated. These options – which would not be in place until late 2020 – include ordering intermediate carriages for the existing fleet and leasing trains from UK providers. The NTA has said, however, that these solutions are hampered by the fact that the Irish rail network operates to a different gauge than the UK and most other European countries, and any second-hand vehicles would require modification for Irish use. “A decision on the viability of the second-hand vehicle option approach will be made later this year,” an NTA spokesperson has said. These short-term options also need to deliver “at least 40 carriages” to meet demand, Irish Rail has said. To put it simply, there isn’t a train shop you go into to buy trains and get them running immediately. Over the next 10 years, the train service also needs an additional 300 carriages. There are currently 629 carriages in operation. 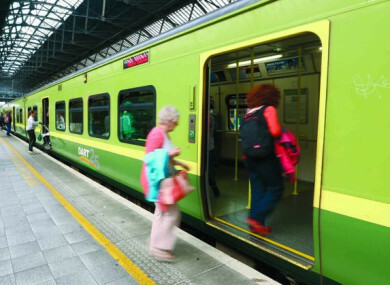 A third short-term option – the refurbishment and reuse of 28 disused train carriages – was shelved, the Irish Rail spokesperson has said, when anticipated costs ran to over €30 million. Irish Rail operates DART (frequent stop service), Commuter (limited stop service) and Express (Intercity and Enterprise) services over a two-track railway. Therefore, a minor delay on one service can have an impact on all others. Irish Rail has said that it “appreciates the frustration any delays can cause customers”. We are at all times working to minimise delays particularly at a time of year for us where we experience both low rail adhesion and the highest levels of demand. As more leaves fall, though, and the NTA works on its secondhand vehicle option, there are practical options to ease the pressure on an already congested public transport system and its beleaguered passengers. “If you don’t have to travel at peak hours, don’t travel at peak hours,” says RUI’s Gleeson. In poorer weather conditions, Gleeson also suggests allowing extra time for journeys. Gleeson advises pregnant commuters to wear ‘Baby on Board’ badges, launched in July to encourage passengers to give up their seat. If you feel uncomfortable or you feel ill, disembark the train at the next station and seek assistance from another member of the public or a member of staff. Email “Experiencing public transport delays this week? Here's why”. Feedback on “Experiencing public transport delays this week? Here's why”.